Designed by Niels DiffrientDescribed by The New York Times as "the gold standard in office seating", the Freedom chair redefines the concept of traditional task chairs. Designer Niels Diffrient aimed to design an office chair that automatically adapts to the user, allowing them to move freely from posture to posture. 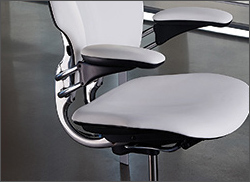 Diffrient’s unique approach removed complexities found in other chairs, such as cumbersome recline levers and back tension dials for a truly ergonomic task chair. As a result, he developed a recline mechanism that perfectly adjusts to the user, definitively reinventing modern task seating to be truly simple, functional, and beautiful. 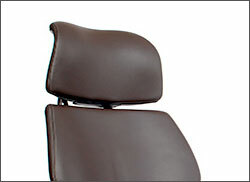 The Freedom chair features a dynamic, articulating headrest to support the head and neck as users recline. It moves with the sitter, so they can changes postures without making manual adjustments and stay comfortable in any position.